The Reset Girl’s Happy Place Club is an uplifting, encouraging and fun online club we hope you will love! Members share photos of their planners, listing and memory keeping layouts, craft projects and spaces, achievements, self-care routines, tips and ideas. We encourage members to share a happy moment from their day, something they made or a goal they are working on. Sometimes our joy in the little things needs to be shared to encourage others when they need it most. This month I am hosting a fun challenge in the Club. Just visit TheResetGirl.com and download the FREE Bingo Card printable to play along. And just cause we like you, we even threw in some fun extras like our Me Time journal card printables and our Self-Care Goals planner printable for FREE. To participate in the challenge, just complete the prompts on the card to win a BINGO, or go the extra mile and complete them all for a blackout. Work at your own pace and have fun! 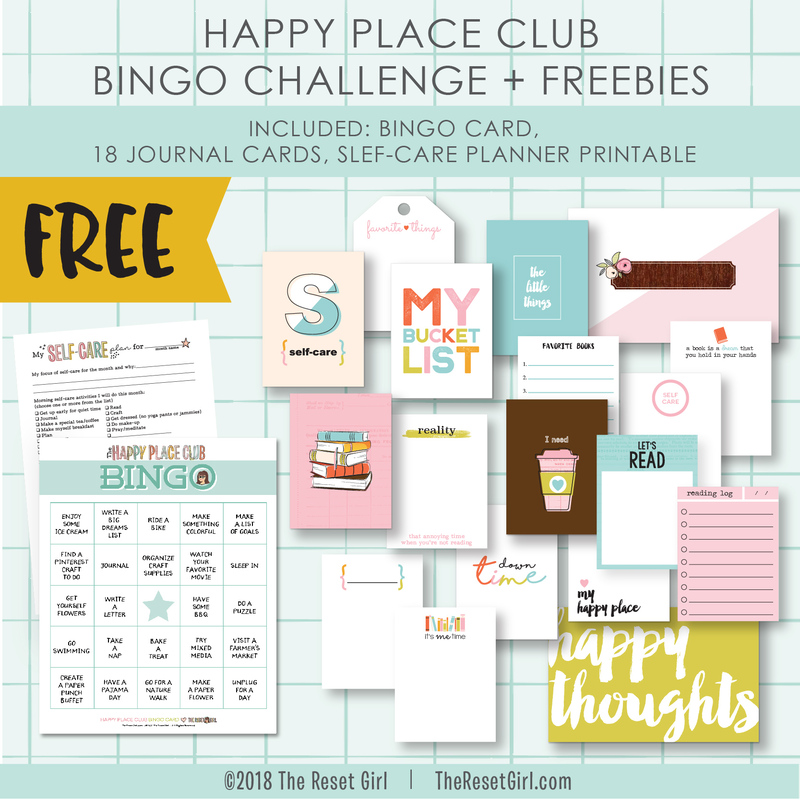 Post on social media using #HappyPlaceClubBingo. Share your BINGO progress and what you did to complete the prompts. Super fun right? While you craft, how about some lovely music? I made a Crafting Jams Playlist just for the club! Want more crafty ideas to work on this month? How about a CraftyPlaceCommonBook? Watch my video here. How about putting together a Self-Care Planner? Watch that video here. How about a whole new TN setup? Watch that here. And of course, you always do a Happy Place Club Challenge from the past to get your crafty juices going. Right now we are offering an 80% off coupon you can use on any regular priced item in the shop (like a prompt sheet)! Use ‘LetsReset’ for the coupon!